Just before xmas I bought this little mid-century bureau. It was dirty, a little bit knocked about, and it didn't have a key, which is probably why it cost me only £5. I've given it a thorough clean and polish, my genius Dad has made a new key to fit the existing lock, and it's now the perfect telephone table/laptop desk, with added filing space so for once I have a vague idea where important paperwork is. One thing I particularly like is that unlike a lot of bureaux, it has a flat pull-down front, rather than a sloping one. Not sure why this matters to me, I just think it looks a bit more elegant. There's no makers mark or label, but the distinctive black legs made me wonder if it was a G Plan. 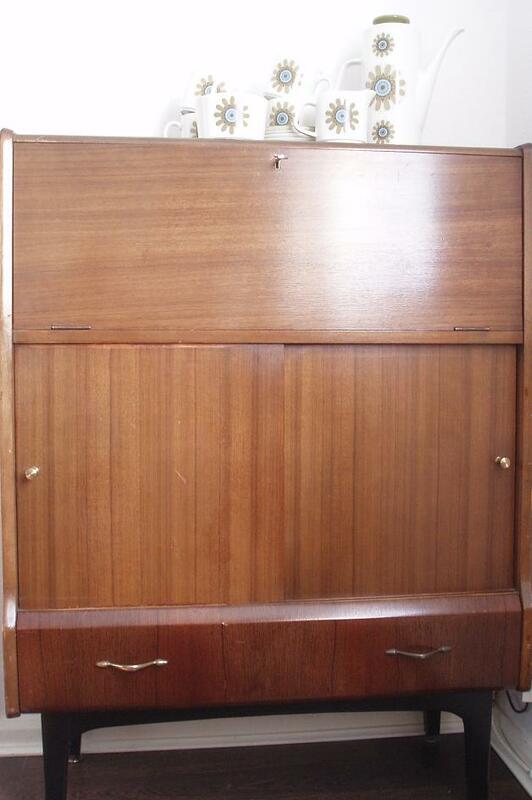 A bit of Googling turned up an identical one on ebay, listed as G Plan, and with a Buy It Now price of £130. I'm glad it's a bit knackered, as if it was in better condition I'd have to consider re-selling it, but this way I get to keep it. On the top of the bureau is a more recent bargain - a Meakin Studiocraft coffee set in the Galaxy design. It's in really good condition, and cost me only £3. 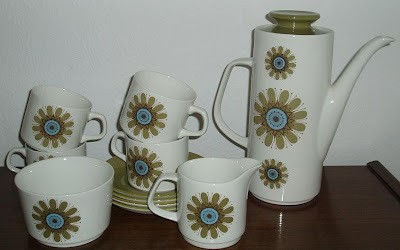 I love the shape of the coffee pot, and the pattern is one of my favourite Meakin ones. I am really trying hard to resist buying coffee sets, but keep being tempted by lovely ones at good prices. Just going over to Flea Market Finds to check out everyone else's finds and add mine. I'd say that coffee set was irresistable, I love the colours, the groovy flowers and the shape of the spout. As for that awesome desk, well, it's awesome. Love the black legs. What a great find. Very nice! And gosh - the coffee set is gorgeous! I would have been unable to resist also. Love the coffee set - very nice! 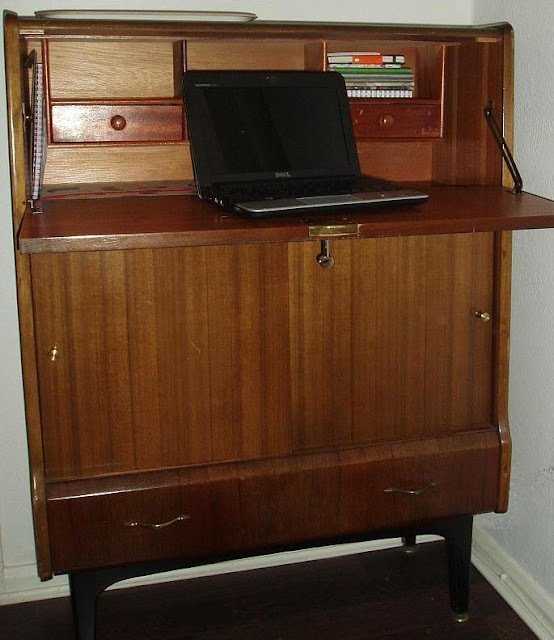 The bureau is beautiful... I've never seen one like it. Great find! Your dad is totally brilliant for working out a key solution! Beautiful coffee set! I, too, have trouble resisting a beautiful mid century piece, regardless of my overabundance!